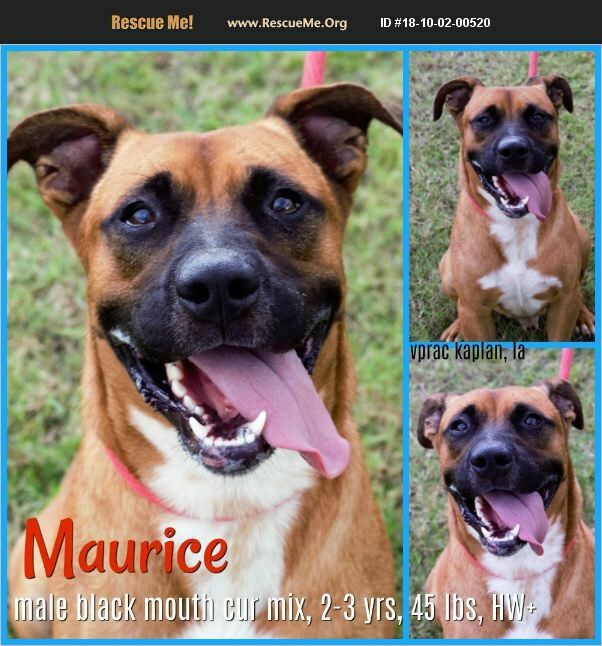 9/22/18(S)- Maurice is a male Cur mix.Approximately 2 yrs old.Weight 45.5 lbs.Available 9/27/18. To donate towards rescue: http://fnd.us/a1PON5?ref=sh_67TWt2 *Please note this animal is not with AAVA - we are networking for rescue as the liaison for the shelter* This baby is in a kill shelter in Abbeville, LA which does not allow public adoptions. Animals must be pulled by an approved rescue or can be adopted through AAVA. TO ADOPT - fill out an application at http://aavarescue.com/adoptions.php RESCUES - all rescues must now go through AAVA. Please contact us at animalaidvermilion@gmail.com. If you are not already approved please fill out a rescue application at http://aavarescue.com/rescues.php TO FOSTER - fill out an application at http://aavarescue.com/volunteer.php If you have any questions please contact us at animalaidvermilion@gmail.com or (337) 366-0212 or visit our website http://aavarescue.com/ for more information. To donate to AAVA's general rescue fund which helps support the shelter animals needs visit this link paypal.me/animalaidvermilion or visit our website http://aavarescue.com/support-our-rescue.php Shelter needs can include items such as laundry detergent, baby pools, flea medication, dawn soap, heaters and fans, toys, gas for transports, pull fees for unfunded animals and other types of items.